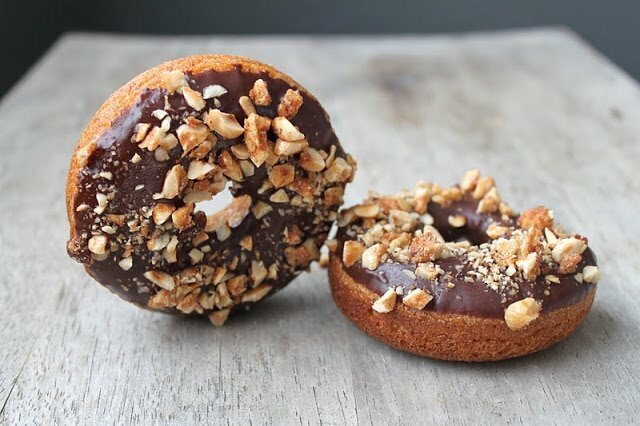 These baked chocolate hazelnut crunch donuts are a great alternative to traditional fried doughnuts. 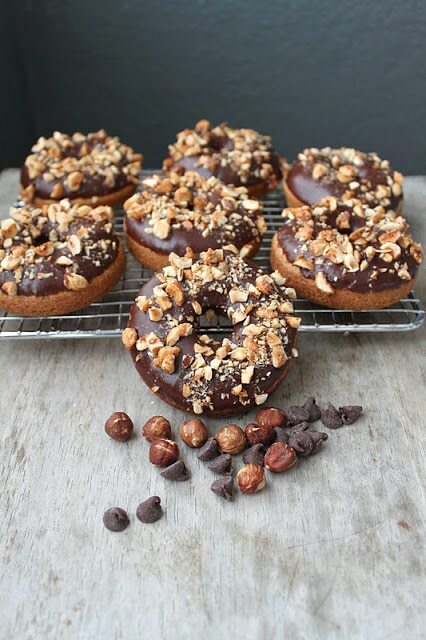 They are dipped in chocolate glaze and topped with chopped roasted hazelnuts. Chocolate and hazelnuts. Such a winning combination. Think about the success of Nutella, Ferrero Rocher, and Perugina Baci. Delicious and delectable treats. 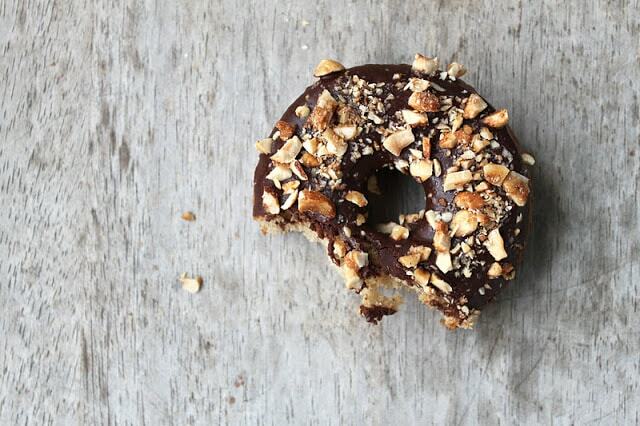 Now combine that with donuts and I introduce to you, chocolate hazelnut crunch donuts. Ever since I visited Portland this summer I have become obsessed with donuts. Especially those from Voodoo Doughnuts. 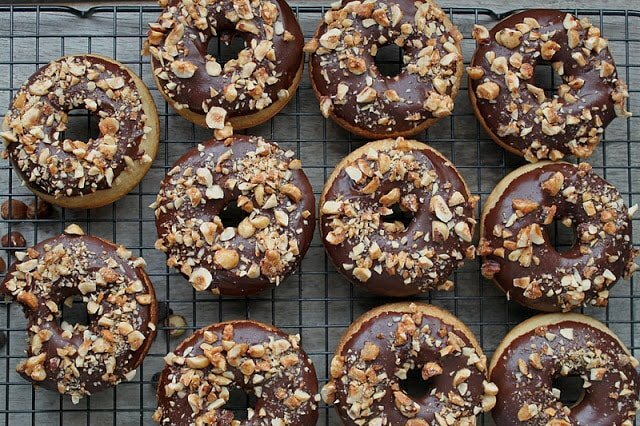 With crazy flavors like the Memphis Mafia which had banana chunks, cinnamon sugar, chocolate frosting, peanut butter, peanuts and chocolate chips all piled on a fried piece of dough, its no surprise that my boyfriend and I were hooked. It also didn’t help that they had a 24 hour location walking distance from our hotel. I don’t want to talk about how many times I wandered over there. I really need to get over my fear of hot oil so I can make some proper fried donuts. In the meantime, I’ll stick to baked donut making. I had so much fun with my mini Halloween donuts that I ended up purchasing the large donut molds as well. Too often, I buy kitchen gadgets and baking tools that end up unused, tucked somewhere in my pantry never to be seen again. Luckily, these donut molds are destined with a better fate. Especially with Christmas around the corner, I know my mother will be asking me to make holiday inspired donuts. No complaints. I already have some ideas in mind. I’m thinking apple cider donuts drizzled with some bourbon caramel or peppermint chocolate donuts dipped in white chocolate and sprinkled with crushed candy canes. What do you think? Any suggestions? Preheat oven to 375 degrees F. Lightly grease donut pans. Pour all of the mixed wet ingredients into the large bowl with the dry ingredients. Fold together until batter is smooth and there are no more traces of the dry mixture. Transfer batter into a large piping bag fitted with a large piping tip. (I used an 18 mm tip) Pipe batter into the donut pans, filling each cavity until half full. Bake for 10-12 minutes or until cake springs back when lightly touched. Remove from the pan and let cool on rack. If you have raw hazelnuts with skins on, toast them lightly in a preheated 325 degree F oven for 7-10 minutes. Rub the toasted nuts together using a kitchen towel to remove the skins. Once cooled, roughly chop the nuts. Set aside. Hand whisk the egg whites until foamy. Pour in the chopped hazelnuts and stir to coat evenly with the whites. Sprinkle sugar, salt, and cinnamon over the nuts. Spread the nuts onto a parchment lined sheet tray. Bake for 10-15 minutes, stirring the nuts halfway thru, until almonds look golden. Remove the nuts from the parchment before allowing to cool. If chunks have formed, break into smaller pieces. Set aside until ready to chocolate dip donuts. Over a bain-marie, melt together chocolate, butter, and corn syrup. Stir until chocolate mixture is silky and smooth. To make sure the chocolate does not overheat, keep the bain-marie at low heat (keep the water from boiling). Let the chocolate cool slightly and thicken a little bit before dipping cooled donuts in and sprinkling with hazelnuts. You have elevated the flavors of donuts to a higher level. This is heavenly! Can’t wait to start making batches…Thanks for sharing! Is there any better flavor combination than chocolate and hazelnut?? These look amazing! Hmmmm…yum. Chocolate and hazelnut, one of the world’s best food pairings. I actually ordered some Bob’s Red Mill hazelnut flour (yes, very indulgent! )not too long ago and have been trying to think of creative ways to use it. I wonder if I could substitute part of the flour in the donut recipe with it! Baked means no fat right? So these are healthy! Hallelujah! @MyFudo I’m excited for you to try these donuts! @Sally Thanks! There are few things better than chocolate and hazelnut. @Laura Hazelnut flour sounds amazing! I think that would really kick up the flavor of the donuts. I definitely think you could sub out part of flour for hazelnut flour. Let me know how it goes. I’d love to try it as well. Just wanted to let you know I made these donuts and my boyfriend and I absolutely fell in love! They were beyond delicious, I attached the link to my post if you wanted to check it out :) Thanks again! These look amazing and I love that they are baked! You can’t lose with that wonderful chocolate hazelnut combination. 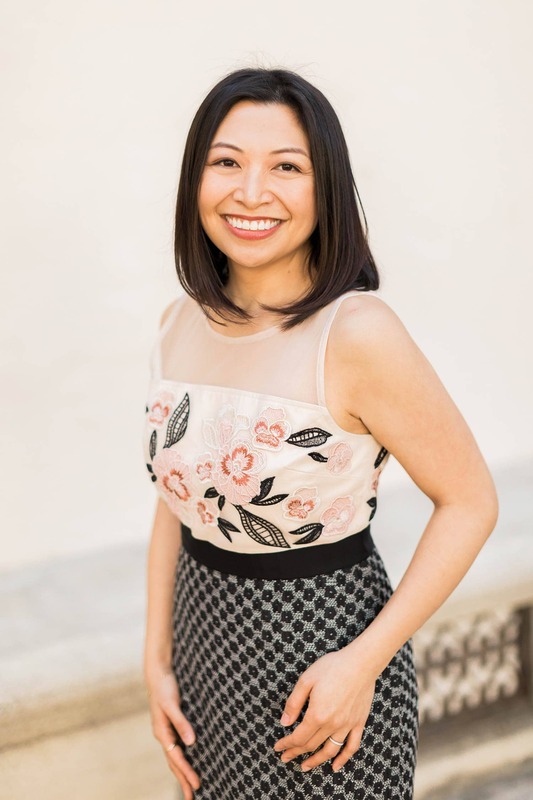 I would love for you to share this post at The Hearth and Soul Blog Hop which is live on my site now. Tina, I’ve never successfully managed a baked donut but these look perfect. I love all the textures – the soft donut, the crackle of chocolate and the crunchy nut topping. Sigh! Definitely remind me of Ferrero Rocher – but add donuts – even better!!! Umm… I might be having a bad day, but: where does it say how many doughnuts this makes? I only see you referring to “the pans” — please help! Thx!! The recipe makes about a dozen standard size doughnuts.